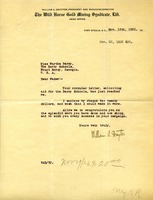 Mrs. Funkhouser writes to Martha Berry to inform her that her and her husband, Mr. Funkhouser, take pleasure in the work being done at the Berry Schools and send an accompanying check. Mrs. Bigelow encloses a small $5 check to help with Miss Berry's splendid work. Mrs Walker enclosed a $10 check. 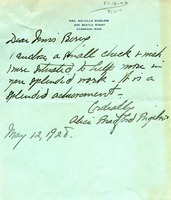 She also says that Miss Berry's splendid effort deserves more. 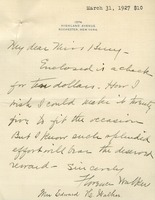 Letter to Martha Berry from William A. Drayton informing her that her letter asking for his help just reached his desk but that he would like to donate $20 and congratulate her on her splendid work, while wishing her every success in her endeavors.